We've come to depend more on the internet - to get answers to questions, learn the news, get entertained, or to help us with our jobs. In fact, there is so much, sometimes It's hard to find the very best. I developed this site to help our USU Summer Citizens find some awesome new resources they can use. Our summer citizens are retired seniors who enjoy lifelong learning. However, everyone is welcome to use this website! So this is an attempt to gather a few of the very best internet resources and share them with you. ​Please note that this site will always be under construction. I'll be adding (or removing) sites constantly. So check back frequently! I used Weebly.com to create and publish this website, and it is an easy to use, awesome tool that you can use, too! NOTE TO PARENTS: Parents, if you're looking for resources for your children, there are some great sites here. However, some sites listed in this collection may have content unsuitable for young children. As a parent, be sure to check out a site thoroughly before allowing your children to go there. Nathan Smith is a Senior Lecturer in the Department of Instructional Technology and Learning Sciences at Utah State University. Director of The Adele & Dale Young Education Technology Center (The YETC) located in room 170 of the Education Building on Utah State University's main campus. The YETC is a combination student open-access computer facility, a K-12 curriculum materials library, a NASA Educator Resource Center for Utah, and a technology training center that focuses on how to integrate technology into teaching and learning. He has worked in this position for the past 26 years. Nathan serves on the Board of Directors for the Utah Coalition for Education Technology (UCET). He has been in charge of their website, and currently is the voice of the organization through the newsletters, emails, and blogs he runs for them. A former elementary school teacher, Nathan teaches students of every age from young children to senior citizens. He taught 4th, 5th, and 6th grades at the Santa Clara Elementary School in Santa Clara, Utah for twelve years. Over the last several years, he has had the opportunity to work extensively with groups of international teachers through the IREX/TEA program sponsored and funded through the U.S. State Department. In 2011, he was invited by the U.S. State Department to go to Amman, Jordan to train high school teachers from Jordan and Lebanon in the use of technology in education, and to share open education resources with them. 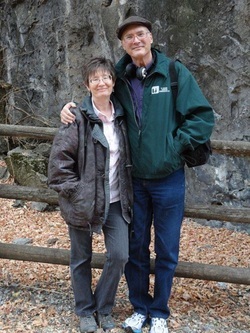 He is pictured above with his wife, Phyllis. They have seven children. Nathan also is an artist, graphic designer, and photographer.